Long Bien has a population of over 170,000 and is made up of 14 administrative units. In recent years, developers have erected office buildings and apartment units in Long Bien. As it is only a 10-minute commute from the city’s central business district, Long Bien District provides companies with lower rents in a location not too far from the city’s centre. Sai Dong is an industrial zone in Long Bien District. Sai Dong A is chosen by Berjaya Land as the site of its 405-hectare township project, which will have villas, townhouses, apartments, schools, offices, shopping malls, and medical centres. It will have an industrial park and a business park as well. The project, estimated at US$2.5 billion, is expected to commence construction this year and will take about six to eight years to complete. Nguyen Van Cu Street is the main street of Long Bien District, Hanoi. It is both a residential and commercial lane. Modern office towers loom over houses, villas, and apartment buildings. 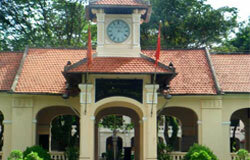 Viet Hung is a new urban area covering about 300 hectares in Long Bien District, Hanoi City. It functions as the north-east entrance of the city and enjoys a great infrastructure. Viet Hung is the site of an ongoing mixed development project, Viet Hung Central Park Complex. The project includes high-rise condominiums, hotels, office buildings, supermarkets, an amusement park, tourist facilities, and entertainment centres.